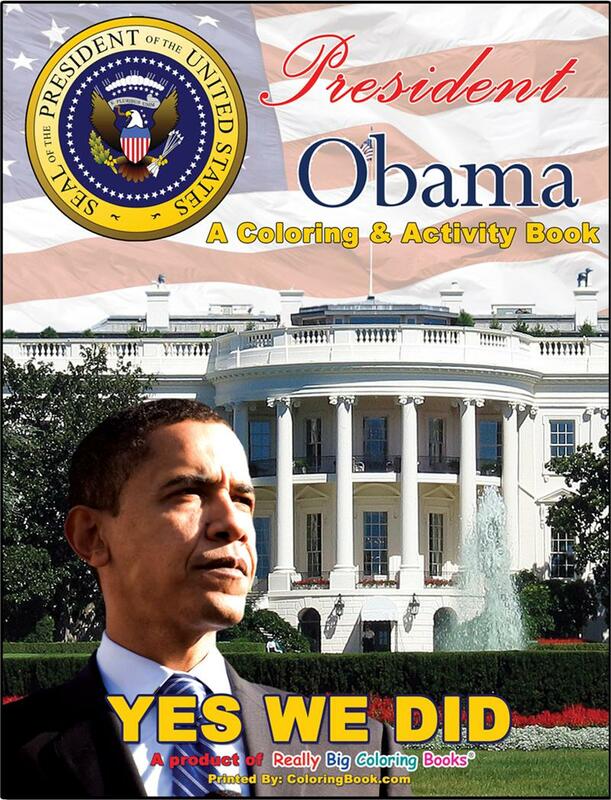 The Yes We Did commemorative coloring and activity book reflects and celebrates change in America! Features include patriotic songs, historical locations, facts and pages describing how children may be involved in their local community along with fun games, mazes and puzzles. In addition to biographical sketches of President-elect Obama, Vice President-elect Joe Biden and First Lady Michelle Obama, this historic and commemorative book includes prominent national sites such as: the Liberty Bell, the Statue of Liberty, the Smithsonian, the United States Capitol and, the Obama family’s new home, the White House! The covers are printed on thick glossy card stock while the twenty-four (24) inside pages are high-bright coloring pages that will be suitable for framing or classroom use! Copyright RBCB ® 2008 All Rights Reserved. This is not a workbook and cannot be photocopied. President Obama "A Coloring & Activity Book"
ISBN 0-9763186-8-7 1. Educational-Family-History. 2. Government-Politics-Public Figures. 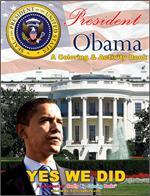 Summary: Inspirational account of Barack Obama becoming 1st African American President in US History. Collection of information with prominent political events, historic landmarks; including songs, games. Sources: Artwork by RBCB artists & staff, images from shutterstock, U.S. Government, Wikipedia. This is a great editorial workbook for children and parents. Please call 1-800-244-2665 for information. I received the Obama coloring books TODAY! They are just fabulous--we love, love, love them! Thanks so much for the speedy shipment! This coloring book is amazing because it not only is fun for my kids to color in and provides hours of entertainment for them BUT it is incredibly educational for them, as well. My kids have many of the Really Big Coloring Books that have been released and they seem to love every one of them. I love the fact that these books allow my kids to spend their time creatively learning rather than staring at a television screen. The information in the books is interesting and educational for everyone. We look forward to more titles coming out! Way to go coloringbook.com. This is a winner! I just received my order and was thrilled to see the content in this book. Not only will children learn from this coloring book, adults can too! I thought the activity pages were great. I am going to give these out to all my friends with children. I live a very long distance from my two grandchildren and I wanted to give them something to keep them involved in these unique and historic times. I addressed the order to them. My daughter said she opened the box and then went to do something. When she came back, my grandkids had each taken one and began coloring in them immediately. She, also, said that they slept with them the first night! I love the fact that the coloring book is so educational and comprehensive. It includes the words to The Star Spangled Banner, The Pledge of Allegiance, My Country 'tis of Thee, and God Bless America. It, also, includes word searches, matchings, mazes, and ways that kids can get involved and help out in their communities. I bought two for myself. So, now, my husband and I have a great link to talk about Barack Obama with our grandkids!!! As a teacher, librarian, and storyteller, I highly recommend this! A great buy!! The Obama Book is absolutely georgous, wonderful. I ordered 30 and gave them to my grandchildren and my nieces and nephews and I kept one for myself. The book is very nice, very well done and is professional, well done, well written and it is just absolutely georgous. Now my brother in law is going to order some books.